TH E M R EP O RT | 41 O R I G I NAT I O N S E R V I C I N G DATA G O V E R N M E N T S E C O N DA R Y M A R K E T THE LATEST ORIGINATION Lenders, It's Time to Educate Borrowers on Mortgage Innovation Many homebuyers think mortgage products are not innovative enough and look instead for lower rates or points. T he Modern Homebuyer Survey by ValueInsured, which asked homebuy- ers what they thought of mortgage lending, found they see little differentiation and innovation from mortgage lenders, making shopping for the lowest rates and points their main goal when it comes to shopping for a mortgage. 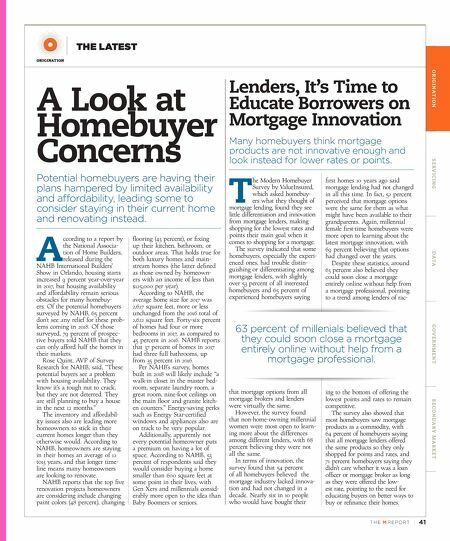 The survey indicated that some homebuyers, especially the experi - enced ones, had trouble distin- guishing or differentiating among mortgage lenders, with slightly over 53 percent of all interested homebuyers and 65 percent of experienced homebuyers saying that mortgage options from all mortgage brokers and lenders were virtually the same. However, the survey found that non-home-owning millennial women were most open to learn - ing more about the differences among different lenders, with 68 percent believing they were not all the same. In terms of innovation, the survey found that 54 percent of all homebuyers believed the mortgage industry lacked innova - tion and had not changed in a decade. Nearly six in 10 people who would have bought their first homes 10 years ago said mortgage lending had not changed in all this time. In fact, 52 percent perceived that mortgage options were the same for them as what might have been available to their grandparents. Again, millennial female first-time homebuyers were more open to learning about the latest mortgage innovation, with 69 percent believing that options had changed over the years. Despite these statistics, around 63 percent also believed they could soon close a mortgage entirely online without help from a mortgage professional, pointing to a trend among lenders of rac - ing to the bottom of offering the lowest points and rates to remain competitive. 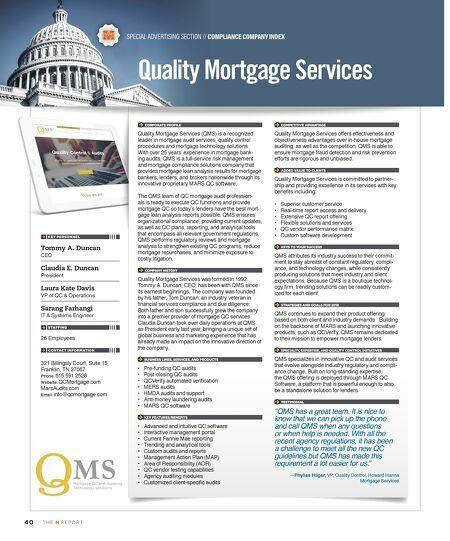 The survey also showed that most homebuyers saw mortgage products as a commodity, with 64 percent of homebuyers saying that all mortgage lenders offered the same products so they only shopped for points and rates, and 71 percent homebuyers saying they didn't care whether it was a loan officer or mortgage broker as long as they were offered the low - est rate, pointing to the need for educating buyers on better ways to buy or refinance their homes. A Look at Homebuyer Concerns Potential homebuyers are having their plans hampered by limited availability and affordability, leading some to consider staying in their current home and renovating instead. A ccording to a report by the National Associa- tion of Home Builders, released during the NAHB International Builders' Show in Orlando, housing starts increased 9 percent year-over-year in 2017, but housing availability and affordability remain serious obstacles for many homebuy - ers. Of the potential homebuyers surveyed by NAHB, 65 percent don't see any relief for these prob- lems coming in 2018. Of those surveyed, 79 percent of prospec- tive buyers told NAHB that they can only afford half the homes in their markets. Rose Quint, AVP of Survey Research for NAHB, said, "These potential buyers see a problem with housing availability. They know it's a tough nut to crack, but they are not deterred. They are still planning to buy a house in the next 12 months." The inventory and affordabil - ity issues also are leading more homeowners to stick in their current homes longer than they otherwise would. According to NAHB, homeowners are staying in their homes an average of 12 to13 years, and that longer time - line means many homeowners are looking to renovate. NAHB reports that the top five renovation projects homeowners are considering include changing paint colors (48 percent), changing flooring (43 percent), or fixing up their kitchen, bathroom, or outdoor areas. That holds true for both luxury homes and main - stream homes (the latter defined as those owned by homeown- ers with an income of less than $125,000 per year). According to NAHB, the average home size for 2017 was 2,627 square feet, more or less unchanged from the 2016 total of 2,622 square feet. Forty-six percent of homes had four or more bedrooms in 2017, as compared to 45 percent in 2016. NAHB reports that 37 percent of homes in 2017 had three full bathrooms, up from 35 percent in 2016. Per NAHB's survey, homes built in 2018 will likely include "a walk-in closet in the master bed - room, separate laundry room, a great room, nine-foot ceilings on the main floor and granite kitch- en counters." Energy-saving perks such as Energy Star-certified windows and appliances also are on track to be very popular. Additionally, apparently not every potential homeowner puts a premium on having a lot of space. According to NAHB, 53 percent of respondents said they would consider buying a home smaller than 600 square feet at some point in their lives, with Gen Xers and millennials consid - erably more open to the idea than Baby Boomers or seniors. 63 percent of millenials believed that they could soon close a mortgage entirely online without help from a mortgage professional.